On January 10, 2019, The state cabinet approved the new alignment from K R Puram to the airport via Nagawara and Hebbal at a cost of Rs 10,584 crore. 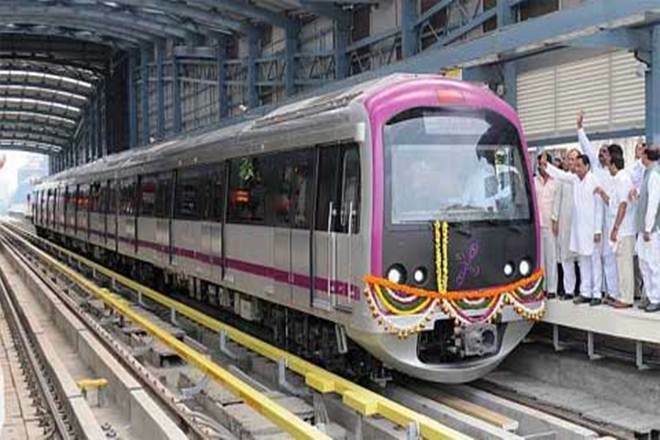 BENGALURU (Metro Rail News): The Bangalore Metro Rail Corporation Limited (BMRCL) is all set to issue notifications to acquire land for six out of the 16 Metro Stations on the K R Puram-Kempe Gowda International Airport Metro corridor. This is followed by the joint survey of properties to be acquired, that was carried out by the Land Acquisitions cell of the BMRCL, The Karnataka Industrial Area Development Board and the State government. On January 10, 2019, The state cabinet approved the new alignment from K R Puram to the airport via Nagawara and Hebbal at a cost of Rs 10,584 crore. The costs almost doubled from the previously proposed route from Gottigere-Nagawara to KIA. Notices to acquire properties in the remaining stations of Nagawara, Veeranapalya, Kempapura, Hebbal, Kodigehalli, Jakkur, Yelahanka, PRR, Trumpet as well as two stations at KIA will be done a fortnight later, he added. “The 36.3km line will run elevated throughout and will go underground at KIA. Two Metro stations are proposed there. One just leading towards the airport, where convention halls and hotels are located to facilitate passengers who want to head to these destinations, and another in the middle of Terminals 1 and 2. So that passenger heading to any of the terminals will have easy access,” the official said. The airport line will totally require 2,30,073 square meters of land for construction of viaduct and stations. 91,532 square meters will be required for the depots. Two depots, one near the airport and another depot at Baiyappanahalli will be constructed. “The Baiyappanahalli depot will have a Metro line running trains from there to KIA and back,” the official said. BMRCL does not foresee any major land acquisition hurdles with much of the Airport line coming up on open land. “We need to acquire 40 houses for the Baiyappanahalli depot while 10 buildings need to be acquired in Kasturi Nagar area. The proposed Metro Station at that point though there has been cancelled,” he said. Land acquisition has already been completed for the Outer Ring Road Line from Silk Board to K R Puram.